How many wardrobes do you own? Maybe you have one set of clothes to wear for casual days, one set of clothes to wear for work and yet another set of clothes for special events. I like the idea of having one core or central base wardrobe made up of pieces that can be worn for any event. Styling can change the pieces from casual to dressed up. 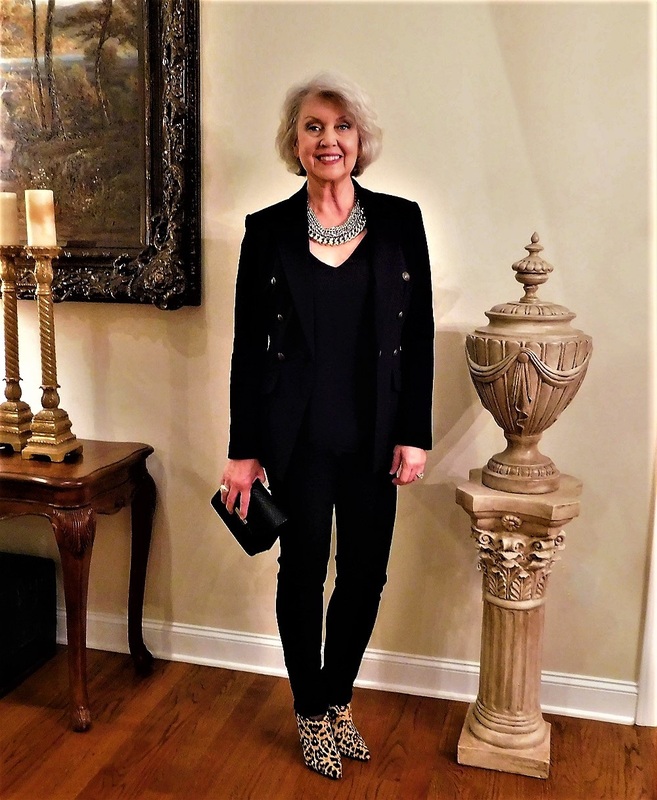 Today I am showing you a couple of the ways I have styled this brass-button embellished black Ponte jacket from Neiman Marcus Last Call. During the day I wore the jacket over a base piece black tank top from Chico’s with another base piece, old straight leg Levi’s jeans. The animal print loafers are old by Vince Camuto. I still love to wear my heels, but I am saving them for when I go out in the evenings. The bag is by Patricia Nash via Dillard’s. A crossbody bag is inherently casual. I am careful to wear the bag near the front and more on the top of my thigh rather than behind me so that the strap isn’t drawing attention to my bust. It was date night so we went out for dinner on the same evening. For this look, I paired the jacket with different base pieces. The pants are by Lior Paris via ShopMyFairLady.com. The layered tank with a V-neck is old from White House|Black Market. The boots are old from Nordstrom. The clutch bag is old and I purchased it at S.M. Bradford on Hilton Head Island. The statement necklace is old from Chico’s. We always share an entree and sometimes it is just an appetizer that we share. In the winter when I am less active, I eat smaller volumes of food. On this evening we ordered a rare treat for us. 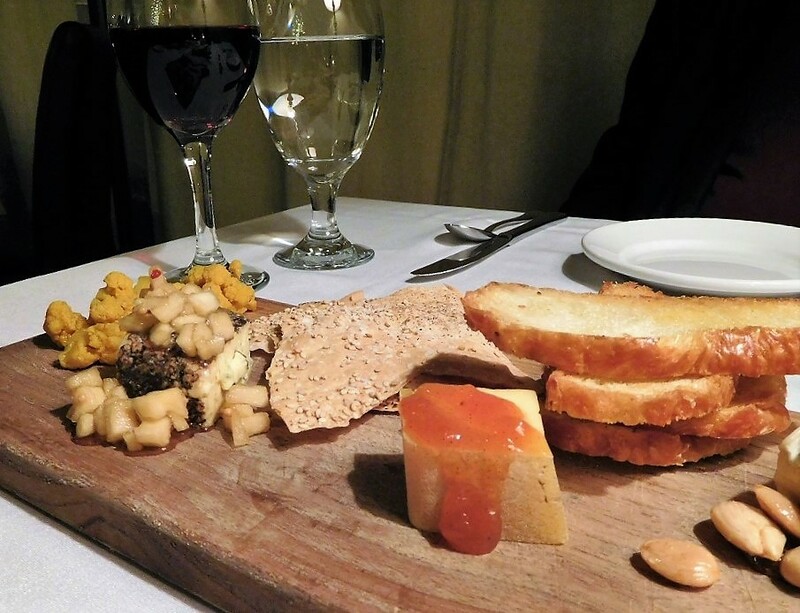 Pictured is an artisan cheese board from Gourmet and Company in Johnson City. I rarely eat cheese, but when I do I make sure it is something special, never that processed orange stuff and I only have a couple of small bites. We each enjoyed a glass of wine, so we wanted to have some food with it. I hope you have a wonderful adventure this weekend! Loved the outfits! Is the jacket navy blue or black? Love the boots and the necklace! Hi Susan! I just wanted to let you know that I ordered a purse from your site and I absolutely LOVE it! It is beautiful and exactly what I was looking for! The ordering process was easy and I received it quickly. I love your style! You are a beautiful person! Thank you so much for the feedback, Sandy. I am so glad you are pleased. I’d like you to give us some more ideas of styling different pieces of clothes like you did today. Thanks. Just one wardrobe here. Both your looks are nice classics & I have fairly similar pieces, except boots & my navy jacket,sadly, is not ponte knit. A number of years ago I came across & bought a knit cardigan type jacket;it was a favorite as it was so comfy! After being mended several times I finally wore it out! 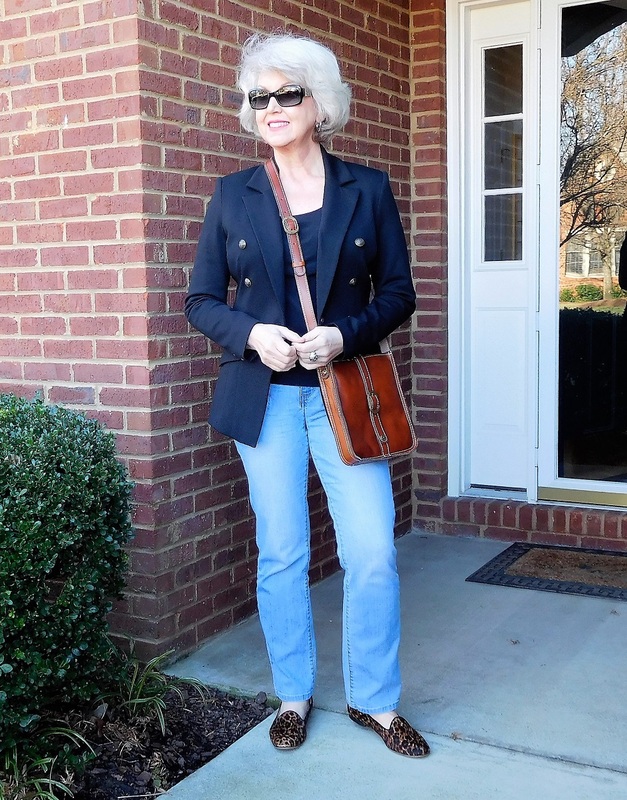 Glad to hear they are available…great leather bag in your casual look. Thanks for all you do! Thanks for that great insightment! I’m going to try to pair down my wardrobe this weekend to pieces that, like, you can serve multi event functions. I am still a W.W. and as such I am not yet ready to invest in pieces that are too expensive, as I will just have to replace them in a short while. Rather, I am going to seek out pieces that are basic: black ponte pants, black pull on pants etc and use those as a jumping off point for my blazers (which I have some very nice traditional ones) and tanks. 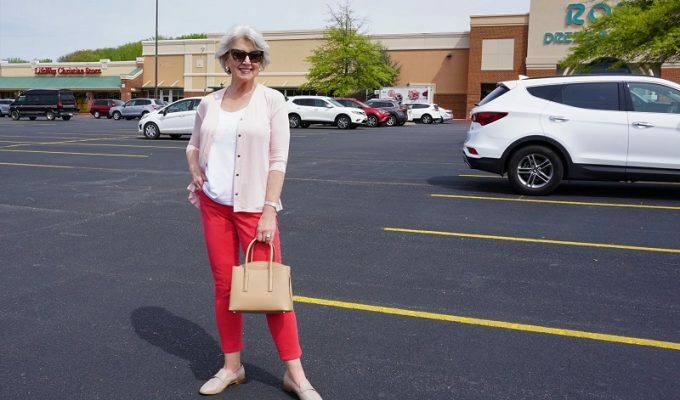 shoes are a different story…… California and my job do not require heels, quite the contrary as a real estate brokers assistant, I do a lot of walking and standing and heels are not comfortable nor practical. I will though look for flats or wedges (in summer) that suit my job function better than heels. 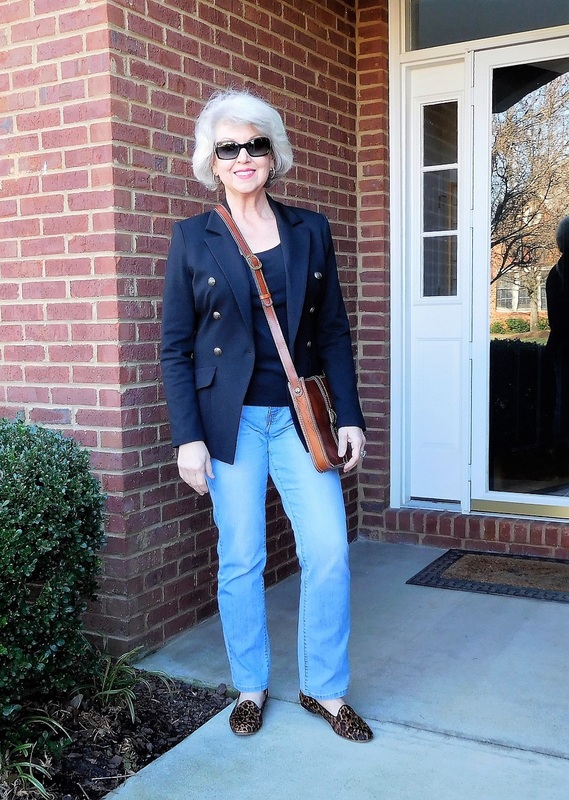 I am large busted and I try to avoid any accessory or piece of clothing that draws too much attention to “the Girls!” NO pockets on shirts and cross body bags with less hardware are my choice. This blog today has given me great inspiration Susan. Thanks! Love your tips Susan, very helpful. You always look so nice. 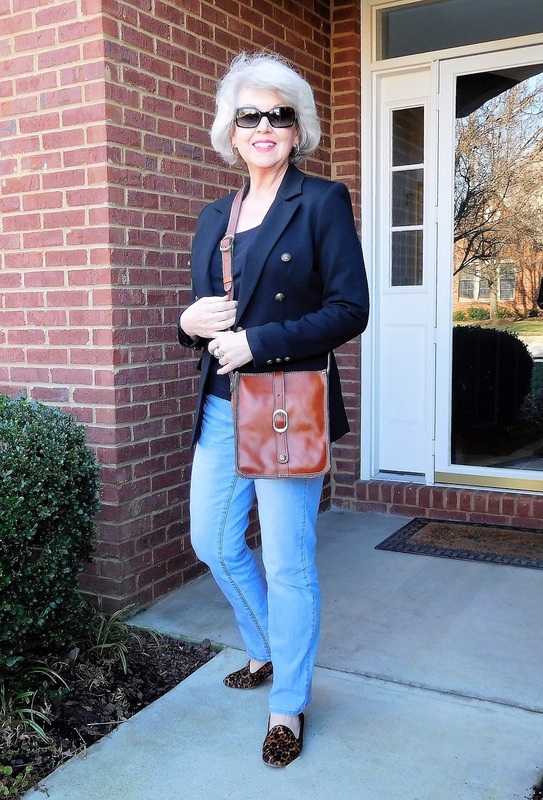 The multiple wardrobe you describe at the beginning of this post is me, but I love your idea of using all pieces interchangeably for work, casual, and special occasions, so I’m going to dedicate this year to building my wardrobe in that way. I bought two tanks from Chicos yesterday and love them. It’s a start. Love your posts, please keep them coming. Hi Susan I quite enjoy your blog. I notice you seen to always be aware of what you are choosing to eat. Is it difficult to control your portions and selections all the time? This post is excellent…more, please! 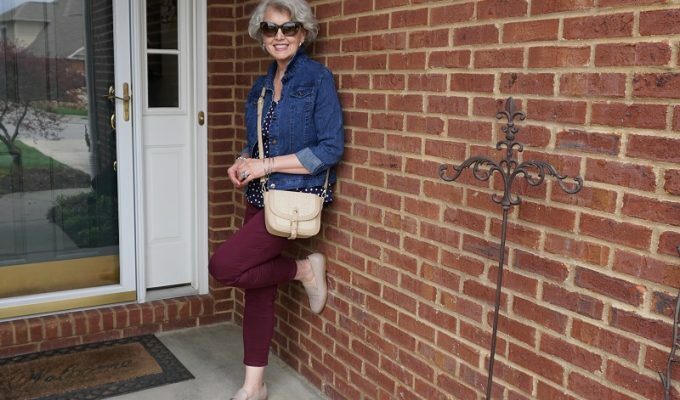 I am retired so no work wardrobe, just casual and a little bit dressier items in my closet. Love the way you showed how a few changes can change the outfit from day to date. You are so right about a couple of bites and the rest all tastes the same. Many times the “pile” of food is not appealing at all. Came upon your blog while looking at shopping sites. So glad I did as I will be following you. I must say I just turned 60 myself in December. And I find your style very refreshing and inspiring. Breath of fresh air! That looks delicious, what willpower! I’m learning so much from you.